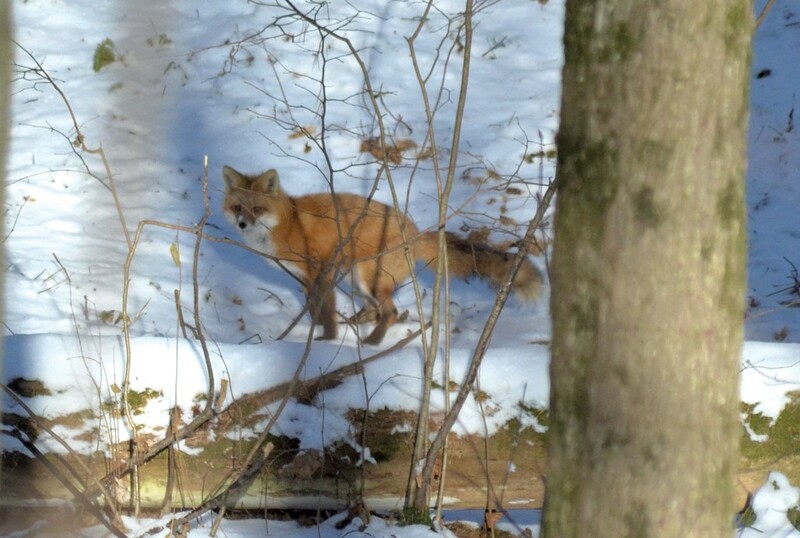 Making Tracks: In Search of Animals in the Winter | Fit Families | Kids VT - small people, big ideas! In the middle of winter, it sometimes feels like everything outside is dormant. But February is actually the perfect time to look for tracks that critters leave behind in the snow. Tracking is a great way to get kids and parents tuned in to all the animal action that is going on right under our noses. One easy way to create instant tracking opportunities — and also improve your skills — is to let your dog (or a friend's pup) into the yard and watch what she does, then go look at the tracks. When she slows from a run to a walk, or stops and looks to the left, what do the tracks she makes at those moments look like? Years ago, my son brought home a handout from his Shelburne Farms Adventures preschool program that has really helped us. It's super simple, but it brought me out of the morass of measurements and movement patterns and gave me the big picture: In the winter, chances are that if you see tracks, it's one of just ten animals: coyote, fox, deer, porcupine, weasel, squirrel, rabbit or hare, mole, vole, or mouse. 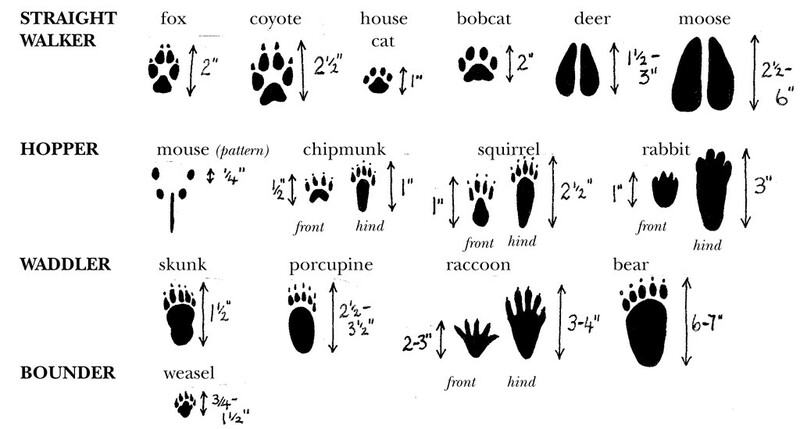 The handout (reproduced in part above) includes images that show what different animals' tracks look like. If you want to see prints right in Burlington, naturalist, educator and tracker Sophie Mazowita's map — which can be found at trackingvt.org — shows the richest spots to go looking. The Intervale and forested places like Centennial Woods and Derway Island are good bets. The best tracks will likely be found fairly soon after a wet snow — before the snow has a chance to melt and change the shape and size of the tracks. If you find large mammal tracks, you can submit photos of them to the Burlington Mammal Tracking Project, a citizen science project Mazowita launched in 2015. If you're heading out with kids, I recommend keeping this in mind: Other than a relatively few species that migrate, every animal who is around in the summer is still here. How — without heated houses, hats, gloves or winter boots — do animals stay warm? Through this lens, a short walk through a field, forest, or even your yard or neighborhood can become rich with wonder. Insects: Because they are cold-blooded, insects don't have to (and can't!) stay warm. Most will spend the winter as eggs, in cocoons, or buried in the ground in leaves or under loose bark. Many are able to survive being frozen. At the base of trees on warmer, sunny days look for snow fleas, which look like specks of black pepper jumping around. Amphibians and reptiles: These cold-blooded animals are hibernating under leaf litter, rocks and logs, or in the mud at the bottoms of ponds. Some species, particularly wood frogs (referred to fondly by some naturalists as "frogsicles"), are able to survive being frozen. Birds: Have you ever noticed a bird looking unusually large? Chances are it was puffing out its feathers to create warmer air pockets next to its skin. Birds also shiver, huddle together, and keep out of the wind to stay warm. Most birds don't use nests for shelter in winter. Some winter birds eat seeds, some eat berries and, believe it or not, some birds, such as chickadees and nuthatches, join multi-species flocks and eat frozen insects all winter long. Mammals: Furry creatures often hibernate or are dormant for much of the winter, but emerge for peak mammal breeding season, sometime between February and April. Many change their eating habits and other behaviors to get through the winter. Mice and voles spend most of their time in the subnivean zone, where trapped heat melts a thin layer of snow right next to the earth and the temperature is kept close to 32°F by the insulating properties of the snow. When I venture out to find tracks, I aim to get home before my fingers and toes have started to get cold, and bring home photos of a nest, a track, or even just an interesting weed that I can draw while I warm up by the fire. My 11-year-old son likes to imagine and draw fanciful pictures of animals in their winter homes. Vermont naturalist Mary Holland writes animal books for both adults and children and publishes a blog called Naturally Curious that has many ideas for what to look for in nature, any day of the year. 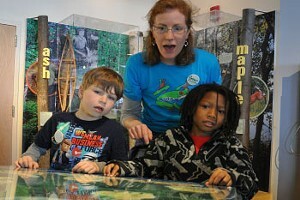 Heather Fitzgerald teaches field ecology and environmental science at the Community College of Vermont and at the University of Vermont.